Happy first day of spring! And welcome to this week’s Wednesday Watch List, where I share the random things that captured my attention and stole my heart over the past week! 1 – In case you hadn’t heard, Lilly Pulitzer partnered with the Pottery Barn brands again this year to design a collection of items! They are so fun and colorful for spring and summer! You can see the full collections here: Pottery Barn, Pottery Barn Kids, and PB Teen. I’ve decided these are a no-brainer (even if they don’t specifically say they are LP, they come up on the product page. They’re too cute to say no too)! 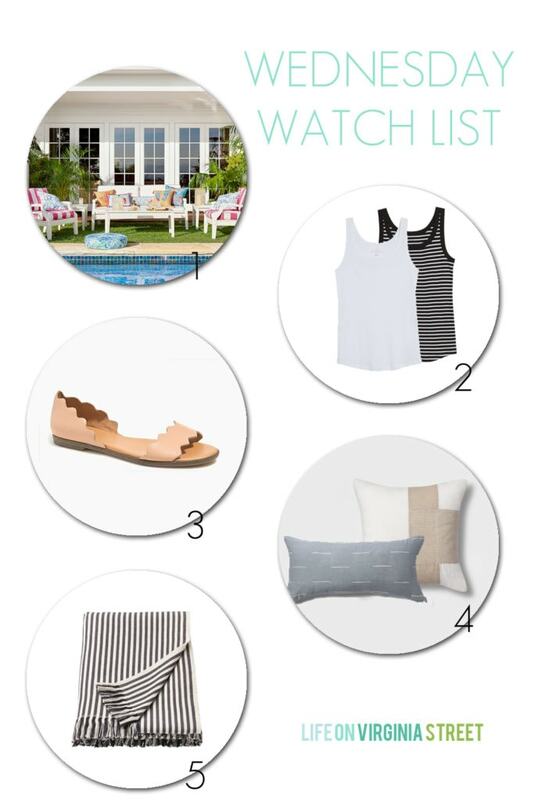 I’ve linked a few of my top picks below – I’m especially loving the outdoor collection! You can click on any of the images in the slider below to learn more about each item. 2 – If you’re on the hunt for some really good, basic tanks, I’ve been loving these. 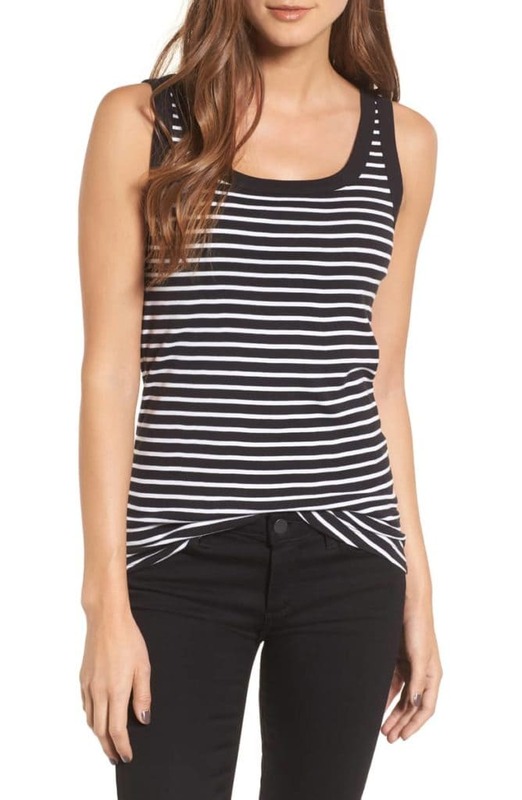 I bought them for the Bahamas in black and white but they also carry gray and a few striped options, as well. Sizes seem to be going quickly, but there is still a pretty solid stock. I like the longer length and they’re great layered or alone (it’s heavy enough it can definitely stand alone)! They do run slightly large, so if you’re between sizes, I’d order down one (I ordered the medium). 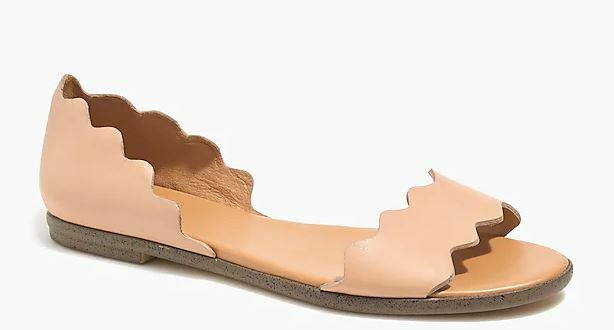 3 – I ordered these scalloped peep-toe flats and they couldn’t be cuter! Like maybe the cutest ever! They remind me of this designer collection of shoes! I got them in the warm beige color but they come in three options. They fit true to size but are a bit narrower where the front band is so you’d maybe want to go up half a size if you have wider feet. I was worried they’d be the type of open flats that would fly off my feet when I walk, but they don’t at all. I’m seriously in love and today they’re 50% off (plus you get an extra 15% off if you’re a cardholder)! 4 – I found this huge collection of new throw pillows and I’m loving so many of the options – and they’re all under $30 (and many are under $20)! I’m really loving this silk blend lumbar pillow and this colorblock throw pillow, but there are so many other cute options! See them all here. 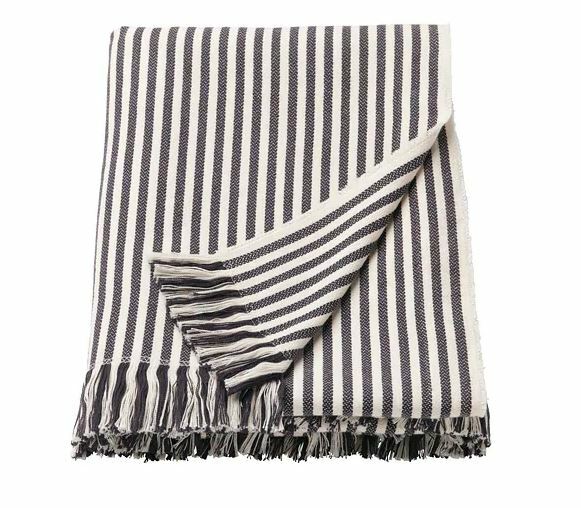 5 – How cute is this fringed striped throw for spring?! And did you know so many of their items were available online now for purchase?! That’s huge for someone like me who lives 3+ hours from the nearest store! You can check out all of their other throws (at great prices) here!